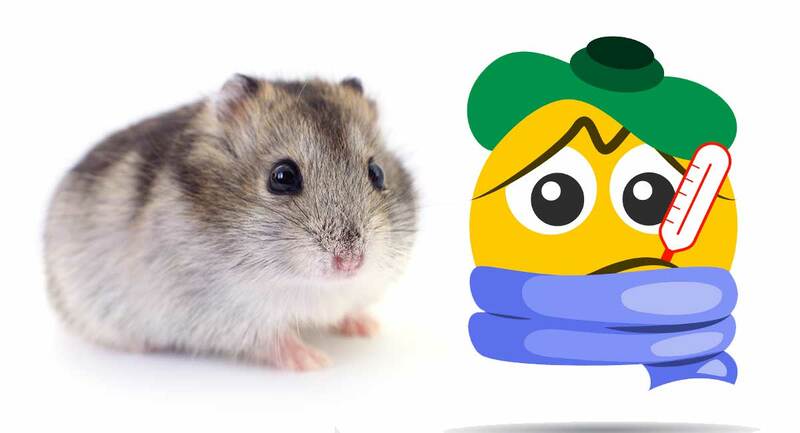 Are you worried about a sick hamster? Hamsters can become ill just the same as any other animal species. But the small size of hamsters adds a level of difficulty to diagnosis and treatment that’s not present in our larger pets. Arguably the most well-known of hamster illnesses is wet tail. But there is so much more to hamster health than this. Given hamsters are so tiny, they have few body reserves and little resilience to fight disease. 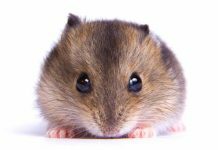 Recognizing sick hamster symptoms early is vital, in order to seek veterinary help and prevent avoidable complications. Don’t worry about making a diagnosis, that’s the vet’s job. The first step is the important one of recognizing the hamster is unwell. For example, is the hamster no longer running on their wheel at night but spending more time asleep? It’s often these small changes that are the earliest clues that you have a sick hamster. Again, if you’re wondering “Is my hamster sick or dying?” then look at the big picture. If there are several small things that don’t add up, then a trip to the vet is well worthwhile. Of course, part of the key is knowing what signs of poor health to look for in the first place. Behavioral Changes: Is the hamster normally friendly, but has become grumpy of late? A seemingly insignificant change such as this could indicate pain. Reduced Appetite: Is the hamster still happily snacking on their favorite munchies or do they ignore a much-loved treat? Ruffled Fur: A sick hamster often neglects their grooming which leads to a dull, starry coat. Diarrhea: Any change from nicely formed pellets should be taken note of. The fluid lost in liquid diarrhea quickly leads to dehydration and organ failure. Breathing Difficulties: A healthy hamster will sometimes breathe very quickly, but it should always be silent and effortless. Labored breathing which involves pushing with stomach muscles, or rattly, squeaky breathing is definitely a sign of a sick hamster. Limping: Broken limbs are common and can happen after being dropped or getting a leg stuck in their exercise wheel. Wet Chin: A wet chin is an important clue that the hamster may have dental problems. Remember, a sick hamster is often very poorly by the time the problem is obvious. By then, they may already be dehydrated and have complications. A hamster’s best chance of recovery is when the problem is spotted early and treated. If you notice one or more of the signs above, play it safe and get your pocket-pal checked by a vet. What problems are most common in a sick hamster? Here are some of the most common hamster illnesses, and in the next section we’ll look at how your vet might treat them. Hamsters can suffer from bacterial or viral infections, just like any other animal. 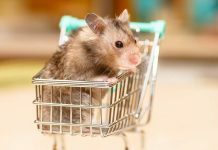 The bugs responsible for common hamster illnesses such as wet tail or chest infections, include Campylobacter, E.coli, Chlamydia, and Salmonella. Sadly, the tiny size of hamsters is against them. A small volume of diarrhea represents the loss of a big percentage of the hamster’s total fluid reserves. When a sick hamster isn’t eating or drinking, this double whammy quickly leads to dehydration and a downward spiral. 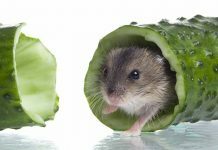 You can reduce the chances of a hamster picking up an infection through washing fresh fruit and veg, keeping the cage clean, and not exposing the hamster to stress (such as a visiting cat). Whereas the most common internal parasite in the dog is roundworms, in hamsters it is a group of single-celled organisms, called protozoa. These parasites thrive in moist conditions (such as a dirty cage) and cause nasty tummy upsets. Some of these of these protozoa, for example Giardia, can also infect people. So be sure to wash your hands after handling a sick hamster. An abscess is a build-up of pus that’s contained in one area; a bit like a blister filled with pus…only bigger. An abscess can develop if the skin’s surface is damaged by a deep scratch or a bite. Bacteria then enters the skin and voila! A common site for an abscess is the head or cheek area. This is often due to dental problems, such as a long tooth puncturing the skin. Abscesses might be treated with antibiotics, and either lanced and drained or surgically removed. If you spot a fresh skin wound then gently salt-water bathe the area. This is a mild disinfectant and may be enough to kill the bacteria which might feed an abscess. The most common hamster cancers affect the skin or the internal glands that produce hormones. A skin tumor can be spotted as a lump. Caught early, skin tumors can sometimes be removed. However, some of these lumps are potentially aggressive and come back quickly. This means putting the hamster through a big operation may not be in their best interests. This is the hamster that is weak and hasn’t the strength to move their legs. The condition is a muscular weakness, rather than a nerve problem. It is caused by a lack of vitamin E in the diet. This is most often the result of feeding table scraps, in place of a regular hamster chow. Simply feeding a balanced diet can prevent this distressing condition. Teeth that don’t wear down evenly can overgrow and cut the lining of the cheek or the tongue. This causes eating and swallowing difficulties. Look out for the hamster with a wet chin and get their teeth checked by a vet. Those small bones are fragile as matchsticks. Getting a leg caught in an exercise wheel or being dropped a short distance can easily result in a broken bone. Hamsters can pick up skin mites from hay or bedding. These mites make the hamster very itchy. It isn’t normal for a hamster to scratch constantly. If you notice this, a trip to the vet is advisable. Another form of mites, demodex, is a natural inhabitant of hamster skin. However, if the hamster is sick, the skin’s natural immunity fails to hold the demodex population in check. This can result in patchy hair loss and scaly looking skin. Those large glassy eyes are actually very large compared to the eye socket they sit in. Scruffing the hamster tightly, pulls back the eyelids and can cause the eyes to prolapse or ‘pop out’. Prompt action to close the eyelids over the prolapsed eye often does the trick to replace it. Hopefully your hamster lives a long and happy life. With old age come problems common to many species, such as arthritis. Cushing’s disease: Caused by a small brain tumor, the hamster is hungry and thirsty, and their skins become very fragile. Amyloidosis: Fat is deposited in the organs which stops them working properly. Nephrosis: A form of old-age kidney failure. Uterine Cancer: Common in elderly female hamsters. One of the most important treatments is to keep the hamster hydrated. You can slowly drip feed water into their mouth or the vet may inject fluids under the skin or into the belly. If an infection is present, the vet may prescribe antibiotics. Injections of terramycin or oral doses of enrofloxacin (Baytril) are frequent choices. There are also numerous antiparasitic medicines which vets can prescribe for internal and external parasites. Diarrhea can cause the hamster to loose vital bacteria from inside the gut that help digestion. 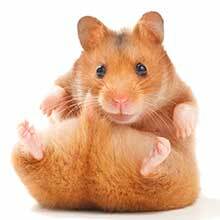 In a form of ‘hamster probiotics’, the vet may suggest feeding a slurry of faecal pellets from a healthy hamster to a sick one. This helps repopulate the gut with helpful bacteria and aid recovery. It’s also important to keep a sick hamster warm. Their small size and large surface area means they quickly become chilled when ill, which makes it harder for them to get well. Give your hamster a good diet of pellets with fresh fruit and veg. This provides well-balanced nutrition to strengthen the immune system. But be sure to wash those fruit and veg, to remove possible sources of infection. Spot clean the hamster’s cage every day. This prevents a build-up of ammonia from hamster pee, which attacks the lining of the lungs. Using a hamster litter box can help with this! Avoid mixing together hamsters with other species such as mice or rats. The latter can carry infections that make hamsters sick. Give your hamster plenty of opportunity to chew. This keeps the teeth worn down and in trim. Spot a problem early and seek prompt help, and your vet can give supportive care and antibiotics. This can give the hamster a fighting chance. However, great care goes a long way to prevent hamster illnesses. Do your best to meet the hamster’s needs and the chances are they will live a long and happy life. Have You Cared For A Sick Hamster? Does your hamster have experience of any of the conditions we’ve discussed here? Please share your story with us and other hamster owners in the comments box. Donnelly. Bacterial Infections. Introduction to Hamsters. Merck Veterinary Manual. 2015. Quesenberry & Boschert. How to Tell if Your Hamster is Sick. Hamsters. Merck Veterinary Manual. 2012. Handbook of rodent and rabbit medicine. Laber-Laird, Swindle, & Flecknell. Pergamon Press. 1996. Previous articleAfrican Grey Parrot Lifespan – How Long Do Parrots Live? Next articleSick Rabbit – Is My Bunny Unwell?